What exactly is faith? According to some out there it is a spiritual force that can be harnessed and used for our benefit. Others say that faith is being positive, be it positive thinking or positive speaking. Defintions also include referring to faith as will power, or the ability to survive hard circumstances with an assurance that everything will be okay. 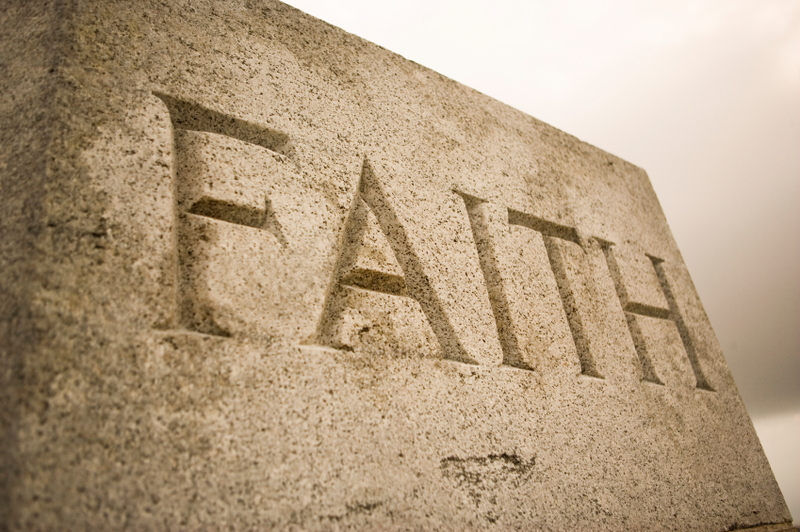 First, to define the term, faith means belief, or trust. It refers to finding something or someone reliable. To have faith in someone is to trust them. Biblically speaking, it is not ever a blind trust either, by the way. True faith is not blind at all. It is not a leap in the dark. Faith comes from hearing the Word of God (Romans 10:17), so we understand that this trust, this deep abiding belief, is based on revealed truth, specifically on the truth of God’s Word. As God reveals Himself to us through His Word He gives us faith, that is, the ability to believe Him. There is also an assurance that comes with true faith, not just a flimsy hope or a false glimmer of truth and reality. We are assured of what is true and real. The atheist may think that there is not a God, but we know better. Through faith we know Him. The atheist’s faith is placed in himself and in his ability to think through questions and contradictions, but the logic and wisdom of men is foolishness to God (1 Corinthians 3:19). The atheist may think he is right, but he can never be sure, he can never know with any degree of certainty other than to trust his own mind. To know that God does not exist one would have to know all that is, and then realize that there is no God. Yet for us, those of us who have placed our faith in Christ, we know who He is, not because we dream up this hope. This is no delusion of grandeur. We know Him because we are His. In order to affirm the positive about where faith comes from we must first expose the negative, that is, we must explain where faith does not come from. Not only will this sweep away several myths floating around the evangelical world, it will also give us a clean foundation upon which to build with the Word of God as we answer the question about where faith really does originate. So what are a few of the incorrect answers out there about where faith comes from and how do we know that they are indeed wrong answers? Let’s look to the Scriptures and allow the Spirit to expose doctrinal error where we find it. The first error we will examine is the idea that faith is produced in the hearts of men. This would be explained as if every man, fallen or saved, has the ability in his own heart without any input or influence from the outside to choose to believe or not believe the Word of God or the gospel. Faith is there, lying dormant until awakened by the yearning of the heart. Does every person have the ability to just believe? Is faith really there deep in the heart of every man, woman, and child, as if all they have to do is dig deep enough and be persuaded to search hard enough to find it, bring it up to the surface, and use it? Does faith originate in the hearts of men? But, someone might say then that there is another verse that may apply and then they will take us over to Luke 6:45. Does this verse change our answer? Ah, yes. The Bible does say that a good man out of the treasure of his heart brings forth good things. Hold one for just one second though. How many men are good? Outside of Jesus Christ, how many good men are there who bring forth good things from their hearts? So how many good men are there who can bring forth good or faith from their own heart? None. Left to ourselves all our heart can bring forth is sin and wickedness and evil. Even the things we think are righteous are nothing but fithly rags in God’s sight – that is how holy He is and how sinful we are without Jesus Christ. We see then that faith does not originate in the hearts of men. Is faith a product of the minds of men? Just as we asked about the heart, what about the mind? Is faith there in the mind waiting to be drawn out? Is it a matter of hearing and deciding to believe what you hear? God asks, “Who has put wisdom in the mind?” (Job 38:36). Wisdom is defined as the discipline of applying truth to one’s life in light of experience. Can we have faith without a perspective that sees what is real and what is not? Can we get wisdom on our own? No. Wisdom is a gift from God, and we must ask for it (James 1:5). So if we cannot even have a proper view of our own experiences without God’s intervention then how do we expect to be able to believe God as if faith was already there and just had to be discovered? The mind, left to itself, only thinks of that which serves self, that is iniquity. For it is the Spirit that leads the mind to think on spiritual matters. In fact, the carnal mind (the mind of fallen man) cannot be subject to the Law of God, meaning left on our own our minds cannot be made to obey God’s Word. Lost men’s minds are blinded and unable to see. Their minds are defiled. So we cannot trust that faith is there in the recesses of men’s minds. The mind is as lost as the heart. Defiled, an enemy of God, incapable of believing on its own. By spirit we mean the spirit of a man, not the Spirit of God. Each of us has a physical (material) part and a spiritual (immaterial) part. We are by design spiritual beings with physical bodies. While our physical bodies will die or be glorified at the Second Coming of Christ our spirit lasts forever. So does each person have faith resting down in their spirit, waiting to be brought out and exercised? Is faith there in all of us? Is it a spiritual matter that we can manipulate or persuade? Does faith come from the spirit of a man? Before being born again we are spiritually dead. That which is dead spiritually surely cannot do anything good and cannot bear spiritual fruit. In our sinful fallen state we can only bear bad fruit, the works of the flesh (Galatians 5:19-21). Is faith just a feeling that we have to work up? It is that we need to use soft lights and soft music and whisper to people with “every head bowed and every eye closed” so that “no one is looking around?” Can it be manipulated? I mean, if faith is a matter of feeling then we could manipulate people into trusting in Jesus, right? Sadly this is the result of Charles Finney’s man centered evangelistic methods, where he stated that if we plug in the right sequence of events then we can arrive at the desired spiritual result, guaranteed. So we have lengthy invitations full of begging, pleading, and manipulation brought into the church. It has devolved even to the point that in some circles ministers and evangelists will give children money and candy if they will come forward, pray a prayer, and be baptized. Can faith be worked up as a feeling? “No.” Faith is not a feeling. We defined what faith is, it is trust, and trust is not an emotion. Beside that, when it comes to sin and faith, the lost man is beyond feeling. There are no heart strings to tug. When it comes to faith, those who walk in the futility of their minds without Christ are past feeling. They only seek to feel good in their flesh, to please themselves, and pleasing God does not please our flesh. In fact, we know that a lost man cannot generate faith in his own in any way shape or form. How do we know this, beyond the evidence already presented? Remember Hebrews 11:6? “Without faith it is impossible to please God.” Add to that the fact that a lost man, those in the flesh with carnal minds, cannot please God. That means they do not have and cannot have faith on their own. So then, those who are in the flesh cannot please God (Romans 8:8).Without Christ, lost, dead in sin, with darkened futile minds, fallen man cannot please God – that is as plain as stating, “Fallen man cannot produce his own faith.” It is impossible. There is one more popular answer. Even after looking at these wrong answers already given some persist. When asked where faith originates or comes from they answer that faith is inherited. We get it from our parents and their faith, or from our upbringing. Is the faith of a parent automatically handed down to their children? Can we inherit faith? What do we inherit from our parents in this regard? Faith is not handed down automatically from parent to child. Seeing these answers then, where does faith come from? How do we “get faith?” We have asked the question, “Where does faith come from?” and we examined a few answers that run contrary to the Word of God so that we could see where faith does not come from. As we learned, faith does not come from men. We cannot say it more simply that this – faith is not produced by, inherent in, or available to any person without outside intervention. Where does faith come from? If it is not something we already have and can pull out and use at will, then where do we get faith? We know that the gospel must be believed for people to be saved, so where does the ability to trust God come from? Where does saving faith originate? The answer is that faith is a gift from God given through the hearing of the Word of God applied by the power of the Holy Spirit as He produces spiritual fruit in our lives. These verses are used to show that salvation is a gift from God. That is very true. Romans 6:23 tells us that “the gift of God is eternal life.” Here we have it in black and white, grace and faith, the necessary means for turning from our sin to Christ is not “of yourselves; it is the gift of God.” This verifies every answer provided to the question about faith’s origin we have studied. Grace and faith neither one originate with us. What is the gift here? The grace or the faith? Well, it is both. It is not one or the other, but both. Everything related to our salvation is a gift from God’s hand. He gives us everything we need to be saved. Amen and well stated. We are not saved by works. We are not saved by what we can do, but by what Christ has done. God gives us grace and faith so that we might trust Him. Praise God for His marvelous gifts. While these verses are quite clear, some might need more convincing that faith is a gift and not something that originates with us. So let’s see what else the Bible has to say about the matter. These following verses show us that everything related to our salvation is a gift, including repentance and faith. Jesus gives repentance to those who then turn from their sin. This is a simple and yet profound truth. It explains why in Scripture some seek repentance but do not find it. Hebrews 12:17 tells us that after Esau sold his birthright for a meal and then lost the blessing, he sought repentance diligently with tears, but did not find it. He could not repent even though he was sorrowful. Why? Because repentance is a gift from God. Left on our own none of us would even desire to be repentant about our sin (1 Corinthians 2:14). Often we confuse repentance for sorrow. We are sorry, but usually only sorry that we got caught, not that we sinned. Repentance is a change of mind, it is a recognition of how awful sin is and a turning away from it. If we are sorry we got caught, or even sorry that we sinned, we still need to repent – to forsake that sin and change our minds about it. Face it, we sin because we want to (James 1:14). Repentance is a negation of that lust, that desire to sin. We cannot make up our minds about sin, so God helps. Have you ever asked Him for repentance when you have sinned? Ask God to make you truly repentant, to give you this gift. When the Jews first heard about Gentile conversions they were skeptical, but based on the testimony of Peter and others that saw for themselves that God had saved these Gentiles, their reply was that God had granted them repentance to life. They knew salvation was a gift from start to finish, given by God in His grace. They glorified Him for giving this gift to Cornelius and those in his house. Who believed? Those to whom it was appointed. This shows that God gives faith for the specific purpose that people will believe and be saved. He does not just give faith and hope the person will use it. No. He gives them active, living faith along with the power and desire to use it. This is how God saves sinners – by giving them everything they need to be reconciled with Him. God takes out the hard dead heart and gives us a soft living heart. This is describing regeneration (Ephesians 2:1-5). He gives us a new heart. He calls us to life. He gives us repentance. And as we see, He also gives us faith. This is why we preach that salvation is by grace alone. It is all God’s work and doing, from start (regeneration) to finish (glorification). It has been granted to you to believe. It is a gift given. And this is not all He gives, but is certainly part of the package of salvation that we receive by His grace. He grants us faith. Want to escape the snare of the devil? God must grant repentance and faith so that you can know the truth and be set free by Him. God must bring us to our senses. He must intervene otherwise we are doomed. Simple and to the point, John states that a man can receive nothing unless it has been given to him from heaven. Ever hear a preacher preach that a person must receive Christ? Yes, we are invited to repent and believe on Him. How do we do that? God must give us what we need because we do not have it on our own. Humbling isn’t it? Eternal life is knowing Christ. He has the authority from the Father to give that life to as many as God gives to Him. God determines who is saved. He gives Christ the authority then to save them. While we refer to salvation as a gift we also see that those who are saved are a gift, given by the Father to the Son. This is where it gets practical as we preach the gospel and call men to repent and believe. We sow the seed. We preach the Word. We share our testimony and tell people what Christ has done. God gives the increase. He is the one who causes the seed to bear fruit. His Word “shall not return to Me void, but it shall accomplish what I please” (Isaiah 55:11). We cannot contain His Word or prevent it from accomplishing the purpose for which He sends it forth. That is why we follow Peter’s example from his sermon on the Day of Pentecost. We preach Jesus. God does the work of saving people. Hear this. It says that it is not a contest between churches. It is not up to us to make people believe. It is not up to us to persuade them and convince them and argue them into saving faith. Our responsibility is to love them enough to tell them the truth – and then leave the results up to God. He gives repentance. He gives faith. He gives the increase. Here is where all boasting is excluded. Some will say that they are saved because of what they did and others are lost because of what they did not do, but the truth is that we do not have anything that was not given to us by God. When God saves us He gives us everything we need to be saved. We are not better or different from others as if we could boast that we chose Christ while others did not. No, Christ chose us (Ephesians 1:4) and loved us first (1 John 4:19). He gives us understanding. Without Him we cannot see the truth or believe the truth or obey the truth. Follow that? Faith, as part of our salvation, if a free gift from God. We do not have it on our own. We do not have the ability to repent, believe, or obey Jesus Christ. He gives us all of that by His grace. These few verses then make a solid case, revealing to us that when we ask where faith comes from we must answer first and foremost that faith is a gift from God. Has He given you repentance and faith? Have you turned from your sin to Christ in faith? If not, ask Him to give you grace. If you come to Him (John 6:37), He will not cast you out or refuse you. So where does faith come from? As we already said, the answer is that faith is a gift from God given through the hearing of the Word applied by the power of the Holy Spirit as He produces spiritual fruit in our lives. Faith is given to us through the hearing of the Word of God. We will see the power of the Word of God as it is the means that God uses to give the gift of faith to those who would believe the gospel and be saved. Let us start then with the hearing of the Word of God. In order to be saved one must call on the Lord, turning from his sin to Christ in faith. The immediate question that the Spirit addresses through Paul is that of asking how can anyone call on God if they do not believe God and His Word and obey the gospel. Further there is the truth that they cannot believe God if they have not even heard of Him. So there needs to be a preacher to proclaim the truth to them so that they might know Who God is and what is required of them to be reconciled to Him.This gives us a hint about what we preach when we witness. We tell them the truth about God and the truth about themselves and their need for calling on Him for salvation. We also must note that this is not speaking of a preacher in the sense of a pastor or evangelist or “official” church position. It is speaking of the role we all have to be proclaiming the gospel to those around us. It is not necessarily preaching from a pulpit, but any proclamation of the gospel from those who know it to those who need to hear it. This preacher must be sent. While we understand the call of God on the lives of those serving as pastors, evangelists, and missionaries, we must not forget that we have all received such a call to proclaim the gospel. Again, all believers in Jesus Christ have been called to go and make disciples (Matthew 28:19-20). We are all to be sowing the seed, because if we do not tell people about God and about their need for salvation, then how can they call out to Him and be saved? God is sovereign in the salvation of sinners, no doubt. He uses us as the means to call sinners to salvation. We see then from this series of questions and answers about who will be saved this truth – faith comes by hearing and hearing by the Word of God. People must hear the Word of God in order to know the truth and believe it. Faith comes by hearing the gospel not just listening, but hearing and understanding the gospel of Jesus Christ. Hearing comes by the Word of God. God uses the Word to open ears and eyes to hear and see the truth. Without Him we are dead, blind, and deaf. But when He uses the Word to open our ears and eyes then we can hear and see and believe and call out with our mouths. And “whoever calls on the name of the Lord shall be saved” (Romans 10:13). This teaches us then the power of the Word of God. It is alive, active, powerful, and unable to be contained or constricted or stopped. Do you think about the Bible as being a living Book? It is living and powerful. It cuts right to the heart of the matter. It is a two-edged sword (Ephesians 6:17). It reveals the true intentions of the human heart and exposes our every thought. The Word of God is a mirror that reflects to us the truth about who we are and what we need. It gives us the standard by which we must be measured to be pleasing to God (James 1:23-25). It reflects to us the truth, unvarnished. The way we respond says much about our faith and maturity in the Lord. The Word of God is the power of God to salvation. It is what gives life when applied by the Spirit. It is what God uses to impart faith. Salvation is accomplished by the application of the Word of God. This power, this Word, never fails. Get that? Often we think it is not enough just to give people the Word of God, but the Word of God is the only thing we have to give people that brings guaranteed results. The Word of God always accomplishes the purpose that God sends it forth to accomplish. The Word is never sent out to fail and return void with no results. Often we forget that the Word can bring several results because often we are seeking one primary result, the salvation of souls. When people are not saved we think that either we have failed in the method we have used to witness or we believe that the Word of God failed and did not bring forth fruit. The Word of God not only brings salvation, it also brings healing, hardens hearts, convicts, sanctifies, and breaks people. The Word is never sent out, not once, that it does not accomplish the specific task that God wants to accomplish. This should give us great freedom and motivation in preaching the Word to those who need to hear it because the results do not depend upon us, but upon the Spirit and the Word. They never fail. The purpose then of preaching is to simply and boldly declare the Word of God to those who need to hear it – that would be everyone. The Scriptures are specific, we do not need a great snazzy program or world class marketing and promotions. We do not need to have raffles and give-a-ways. We do not need to bribe people or manipulate people. We just need to faithfully preach and live the Word. Paul is clear, he did not minister with smooth or flattering words. He says he ministered by “by setting forth the truth plainly.” He says he did not come preaching with “excellence of speech” or “with persuasive words of human wisdom.” He simply and faithfully preached the Word of God. Why do we think the Word is incapable and that we must add our own twist, our own presentation, our own talent, our own persuasion and excellence, as if we were competing with the television or radio or as if it were a performance to be appreciated and applauded? We are not in the business of marketing or contextualizing the gospel. We live to preach the truth of God’s Word to faithfully and consistently sow the seed and let God give the increase. In fact, the preaching of the Word is seen by the world as foolishness. This is why many people abandon churches that preach the Word. They have itching ears, cannot bear up under sound doctrine, and want their fleshly needs and desires met. They come to hear preaching that helps them meet their needs and entertains them instead of to hear preaching that is faithful to the text and confronts them with sin and righteousness. Too many today do not want preaching that is expositional or applicable – they want a quick fix to their problems so that they can tip God in the offering plate and then get on with their life. Let’s be a fool for Christ and preach the message of the good news that Jesus Christ has come to seek and save that which was lost. Stick with the Word and then the results are guaranteed. Even then, we should also take the time to pray for those that hear us. One note – we do not mean by “preach” that we should shout or harass people. The term simply means to proclaim or tell forth the Word of God. Tell people what the Word of God says about God, about themselves, and about what God has accomplished in our life through the Word. Abiding in Christ involves having His Word abide in us. Why? Because without the Word we have no faith, no hope, no understanding, and no salvation. We must walk with Christ, we must be filled with (controlled by) the Holy Spirit, and we should be hiding His Word in our hearts (Psalm 119:11). Do we read and memorize His Word? Do we view it as powerful and sharp and effective? It cannot be bound, chained, or stopped. (2 Timothy 2:8-9). Remember too in all of this that Jesus Himself is the Living Word of God. The written Word reveals to us the Living Word, and there is the source of the power of God’s Word. The Word of God will never pass away. Peter refers to “the word of God which lives and abides forever” (1 Peter 1:23). Do you believe the Word? If not, read it. Faith comes by hearing and hearing by the Word of God. But the manifestation of the Spirit is given to each one for the profit of all…to another faith by the same Spirit..
We have seen that faith is a gift from God given through the hearing of His Word. Now we will see that faith is a fruit of the Spirit produced as He applies the Word to our lives with power. In the first epistle to the Corinthians, Paul devotes chapters 12-14 to the discussion of spiritual gifts. He corrects misuses and abuses of the gifts, demonstrates the proper motivation for and use of the gifts, and lists for us the gifts given. Of course debate rages around which gifts He still gives, if any, or all. It is not within the scope of this study to cover all of that. What we need to see is found in chapter 12 as Paul says that the manifestation of the Spirit has been given to all within the church for the profit of all. These gifts then were given to demonstrate the power of the Spirit for the edification of the whole church. These gifts were not given for personal or individual profit, but to the profit of all. The use of gifts, in order to be true and Biblical spiritual gifts, must be used with this outward view, looking to serve and minister to others within the Body. All spiritual gifts that are given are given by the Holy Spirit for use within the Body by believers. In other words lost men and women do not have spiritual gifts. The Spirit does not equip them to edify the Body. If then we can show that faith is more than a gift from God, more than just a result of hearing the Word of God, but in fact is a gift given by the Holy Spirit to believers for use in edifying the Body then we can show once again that a lost man has no hope of ever having faith on his own. 1 Corinthians 12:9 is an important verse in this study. It tells us that one of the gifts the Spirit gives for the profit of all in the church is faith. It is given according to the Spirit’s will – in other words, it is His decision about when and where to give the gift of faith (1 Corinthians 12:11). It is the power of the Holy Spirit applying the Word to our lives and hearts that gives us faith, the ability to take God at His Word, to trust Christ for salvation, and to progress in sanctification and holiness. The Spirit, who is given as the seal for believers, is indeed given as the down payment on our salvation – He is our Comforter and Convictor and the One who assures us that we belong to Christ (Ephesians 1:13-14). Did you notice we skipped one? Yes, the fruit of faithfulness. The word used specifically is pistis, which in Greek is literally translated as “faith, faithfulness, trust.” So the fruit produced by the Spirit is more than being faithful, it is having faith. We see that faith is a spiritual gift given to the regenerate only as it is produced in their lives as a fruit of the Spirit. How can a lost man have faith? The Spirit has to be at work in His life before anyone has any hope of believing. That is why we started with Ephesians 2:8-9 where we read that grace and faith are gifts from God and not of works. Faith is not something we can work up on our own. Our continued ability to take God at His Word, to trust Christ, is a gift from the Spirit produced as He works in our lives with the Word of God. By having faith their testimony was improved. What does it mean to have a good testimony? Those who have gone before us in the faith, by trusting in God and the promised coming Messiah (by grace alone through faith alone), obtained a good testimony. It is interesting what many today think of when we ask them to give their testimony. The typical testimony starts out with the believer talking about how he or she lived in sin before they trusted Christ, and usually the bigger the sin the more sensational the testimony. Apparently it is more exciting for Christ to save a person from the big sins rather than being equally glorious in saving any sinner no matter their age or experiences in this fallen world. As the testimony unfolds, we hear about all that they struggled with and all that God delivered them from and by the time they get to the point in the story that they were converted, they stop, as if the climax of a testimony is the moment of being born again. In reality, when the Bible talks about testimonies is it talking about telling the story of right now today and the things God is doing in our life. It is a testimony rooted in the moment, not just a telling of everything that happened up until salvation. How often do we recount all that we did before being saved when God does not even remember those things? (Psalm 103:12; Micah 7:19). While we may remember and recount those things the true power of a testimony is seen in how our faith is working right now, today. Yes, it is glorious that we have been saved from sin, but at times I fear that we revel in the depth of depravity before we glory in the unfathomable love and grace of God. As I stated, Biblically speaking, one’s testimony may have some background given, but it is a testimony to what God is doing – it is about our present reality. Another interesting fact here, especially from this verse in Hebrews 11, is that in the original language the testimony is coming from someone else other than the faithful individual being remembered. This is not the elders talking about their testimonies. It is a good testimony from an outside source as to what their faith has accomplished in their lives. Literally, this verse does not say that they worked to gain or obtain this testimony. It states that they were testified of, or had a witness given about them. Here we see in verses 4 and 39 that it is God who is giving this testimony. It is God who is testifying on their behalf, giving the ultimate approval to their lives of faith. So one “side effect” of faith is that God will testify to our obedience (Matthew 10:32). Do we ever think about our testimony from that perspective? What would Jesus say about us if He were asked? Certainly then a testimony could never be given to exalt the man instead of exalting Christ. Del Fehsenfeld, Jr, the revivalist who founded Life Action Ministries, preached often that the only degree that really mattered was the AUG degree. Ever heard of an AUG? It is an “Approved Unto God” degree bestowed when we have a good testimony. Are we living right here and right now in a way that glorifies God and gives Him the opportunity to give a good testimony about us? What other side effects are there from this faith that works? A few items from Romans 5:1-5 and James 1:2-8 are worth noting. Here we see more side effects of faith. We see joy in the face of trials and tribulations. We see patience leading to maturity in the faith. Faith is foundational to the Christian life. It is how we enter new life and how we continue to grow. It is essential to our development and our maturity. Faith, complete trust in Christ that casts out fear and doubt, is required for peace, joy, and hope. It is necessary for patience and a right perspective and outlook on life. Faith in Christ carries us. It really does define who we are and what we do for Christ and what He accomplishes through us. That is why through faith we are able to obtain a good testimony, and it is also why without faith it is impossible to please God. Remember, anything we do that is not faith based is sin. Whatever we do that is faith based glorifies God, gives Him an opportunity to testify about what He is accomplishing in and through us, and gives us a good testimony in the church and in the world. What is our testimony? How is our faith working right now? What good is it accomplishing? What side effects are present in the midst of struggles, trials, victories, and obedience as we continue to walk by faith? It is faith that gives us understanding. Specifically here we are told that by faith we understand that the worlds were framed by the Word of God. Whatever a person believes about the creation or beginning of the universe and life on earth, it is a matter of faith. Will we believe what the scientist tells us? Will we believe the Word of God? Will we believe the fossil record? Will we believe the facts? The truth is that whatever we believe, it is just that, a belief. What we think about the beginning of the world is determined by where we have placed our faith. Of course, since we trust God and believe His Word, we understand how the world came to be. We know that “in the beginning God created the heavens and the earth.” This belief, this matter of faith in the Word of God and in God as Creator, gives us the ability to understand creation. In short, by faith, by what we believe, we come to embrace our worldview. We will study more about that later, but first we need to answer some basic questions about faith and understanding. The first question would be, “where do we get understanding?” According to Psalm 119:104, the Psalmist writes, “Through Your precepts I get understanding.” The “Your” here of course is God. So through God’s precepts we gain understanding. Well then, what are His precepts? The word precept means literally a “charge, or command.” So through the commands of God we gain understanding. You see, the Law of God has been given to us for several reasons. According to Galatians 3:24 the Law is a guardian. It keeps us and brings us to Christ. The Law points to our sin and to our need for salvation and a Savior. It points us to Christ. Further, the Law reveals to us the character of God. The Law is after all rooted in His nature and His character. The Law tells us about what kind of God He is and what He expects of us as we strive to love and obey Him. Through His Law we gain understanding. We understand His nature, His purposes for creation, and His expectation of us as we are empowered to obey His Law and manifest our love for Him through our obedience. Psalm 119:130 tells us, “The entrance of Your words gives light; it gives understanding to the simple.” The entrance of the Word of God gives us understanding. What is He saying here? Reading, hearing, memorizing, and meditating on the Word of God, taking His Words in to our hearts and minds – that gives us understanding. So if we want to have understanding then we must be in the Word of God, reading it, hearing it faithfully preached, memorizing it, and meditating on it. In fact, the only time the word “success” is used in the Bible it is used when talking about the only path to true success being meditating on the Word of God (Joshua 1:8). Further, we gain understanding by heeding rebuke (Proverbs 15:32). When we listen to correction, to rebuke for wrongdoing, when we respond to that correctly, then we gain understanding. We learn what not to do. We learn what God expects of us, and we learn humility. By the way, what are some of the things that the Word of God is profitable for? The Word of God is profitable for reproof and correction (2 Timothy 3:16). The Word gives us the standard to use when rebuking sin in our lives or even in another’s life. In confronting sin with the truth we learn and we teach holiness and obedience. One last note here when it comes to getting understanding is that Jesus through the power of the Holy Spirit gives us understanding. He opens our eyes to the truth, convincing and convicting us with the Word of God. It is not just a matter of the written Word, but the Living Word, the Word that became flesh and dwelt among us, our Lord gives us understanding so that we might better serve Him (Luke 24:45; 1 John 5:20). Perhaps an even more relevant question would be to ask, “What is understanding?” We know how we get it. We know that the Living and Written Word of God gives us understanding. We know it is by faith in the Word that we gain a proper perspective and understand what God has done and is doing for His own pleasure and glory. What exactly is understanding? The best definition I have found in my studies (and unfortunately I do not remember where I came across this) is that understanding is, “the mental disciplines and abilities to discern and obey the truth of the Word of God.” It is the ability to hear and do the Word. In the Proverbs we hear often about three things – knowledge, wisdom, and understanding. The three are necessary for godly living. Knowledge speaks of the facts, or truth. It is information. Information by itself tends to puff us up and makes us proud (1 Corinthians 1:8). Wisdom is “the discipline of applying truth to one’s life in light of experience”. To see beyond the surface and to see things as God sees them, with a view toward eternity, that is what it is to be wise. In fact, we must have a right view of God in the first place if we are to have a right view of anything else (Proverbs 1:7). Understanding joins knowledge and wisdom so that they work together to inform our faith. Understanding takes our experience, joins it to what we know, and as a result then we know how to act and think, even in difficult circumstances. All of this we get freely from God if we ask. (Proverbs 2:6; James 1:5-6). By faith we understand that the worlds were framed by the Word of God. We have studied knowledge, wisdom, and understanding in order to arrive at this foundational truth for the Christian life. Through our trust in God we understand how the world came into being. Here is where our faith informs our mind. We trust what the Word of God says and in believing Him we understand that He created all that is. This helps us understand God’s purposes for creation. As we have already stated, our faith will determine what we believe about the beginning of the world. Why is this important? We are speaking here from Scripture about ones worldview. How we view the world around us, its beginning, its purpose, and its end – all of this determines how we relate to God and to others. It determines our values and how we make decisions. A worldview is part of who we are and establishes how we view creation and even what we think about God. Remember too, as we have learned, what we believe determines how we behave, so what we believe about creation very much works its way out in the way we live our lives. The best definition of “worldview” that I have found I am borrowing from a very valuable and practical study taught by Dr. Ligon Duncan. He said that a worldview is “a set of fundamental assumptions about the most important issues in life.” The question then is whether or not these “fundamental assumptions” are based on the Word of God? How will we inform our minds and our consciences when it comes to the foundational truths about the creation of the world in which we live? As Christians, we should have what is referred to as a Biblical worldview, or a Christian worldview. Sadly though many in the church neglect the Word of God and live in ignorance when it comes to the truth given to us about the foundation of the world. Some have secular worldviews, worldly worldviews and values that reject the truth of God’s Word. How can a professed follower of Christ hold to a secular worldview? It’s simple really. It happens when we neglect the truth of God’s Word and lean on our own understanding (Proverbs 3:5-6) instead of gaining understanding and wisdom from the Word of God. Acting out of fear, because of doubt, or in response to confusion is to impugn the character of God by refusing to believe Him. If we do not act by faith, we do not believe God.